So says Morpheus in The Matrix when Neo comes to realize the “real world” wasn’t what he thought it was. Have you ever had a similar realization that changed what you believed was possible? Learning new marketing tricks can be an eye-opening experience. I was chatting with a fellow entrepreneur on Skype recently. He was watching my updated webinar. 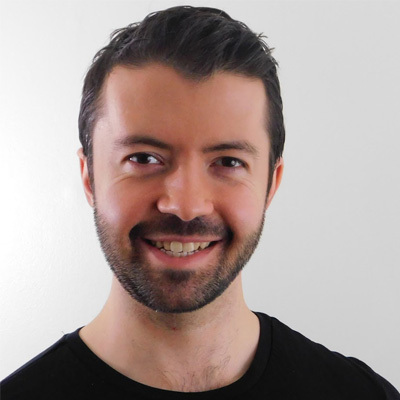 He mentioned my tips section about smart funnels and dynamic email segmentation. He said that for him, that was a “mind-blown” moment. I felt the same way when I first learned about the concept of upsells and cross-sells. Today, I hope to blow your mind by teaching you the concept of tripwires. A tripwire is very similar to the self-liquidating offer we’ve covered in the past. In fact, a product splinter is another name for a tripwire. The latter is just the more popular term. A tripwire is a small offer (usually between $5-$50) sold to new email subscribers after opt-in. It’s meant to accelerate the buyer/seller relationship. People might sometimes join your email list but might not want your core offer. Yes, even after you nurture the relationship. Your first step should be to make a simple and affordable offer. Doing so will help those potential customers overcome fear of buying from you and gain trust. If you think about a relationship with a customer as a slope, the value ladder is a straight line. The customer will visit the website, subscribe to a newsletter, and then boom! That ladder goes way up at an almost 90-degree incline. Then a customer may make a purchase for $100, $500, even $1,000. How do you service a larger market with automation services and still build trust? The answer? A tripwire. A tripwire evens out that incline to convert more people nurture a relationship. Now it’s sort of a 45-degree gradual incline in terms of the relationship. You can then capture more of the market. Eventually, it becomes a no-brainer for the customer to spend money on your product. The truth is, it’s difficult to find examples of tripwires outside of the marketing industry. They do exist, but they’ll often take a different form. This may stretch the definition a little bit, but take for example the Disney Movie Club. You’re getting four movies for $1 with a membership. The membership gets you access to their full library of movies. That offer is the tripwire leading to a subscription. 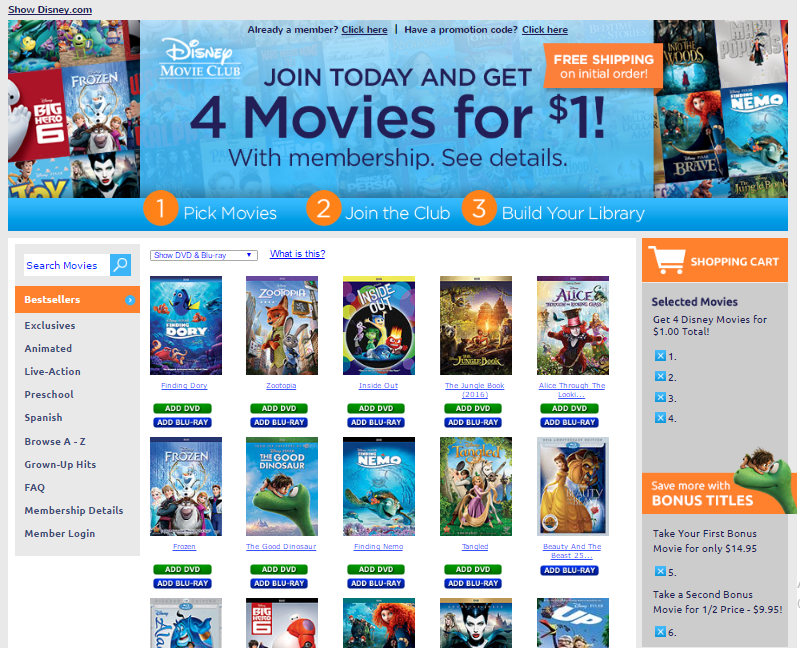 It’s assumed that Disney Movie Club will charge your card after a month and you’ll have to send the movies back. That makes this offer a low barrier to entry in terms of starting a buyer/customer relationship. Just to reiterate, a tripwire is supposed to be a standalone offer. It’s meant to be a stepping stone for building trust and adding value. It’s like climbing up the value ladder, so to speak. I plan on covering the concept of the value ladder in a future blog post. Russell Brunson from DotComSecrets talks about the value ladder in his book, which I have. 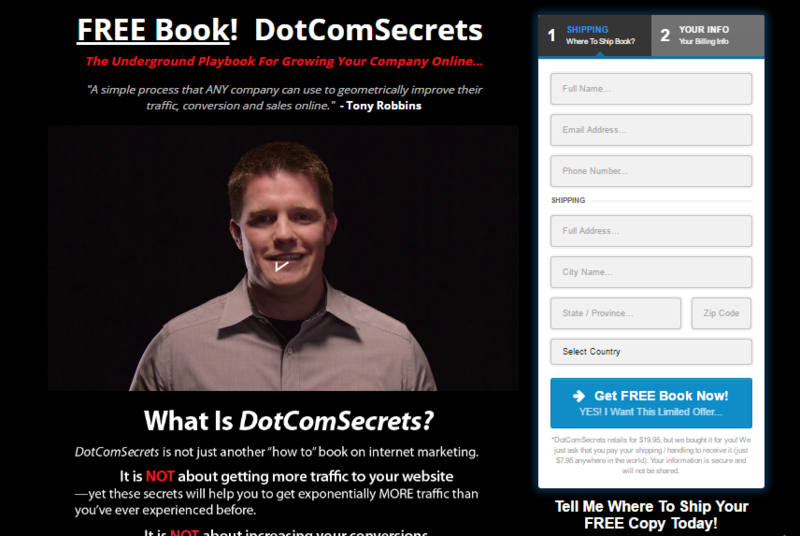 There are a lot of offers on the DotComSecrets homepage, but their tripwire is the free eBook, DotCom Secrets: The Underground Playbook For Growing Your Company Online. This is the book Brunson wrote that I’m reading, and it’s highly recommended. The book presents a starting point to learning more about that. This is a front-end offer. The idea is that people are going to read this book and get some ideas. It’s an opportunity for Brunson to start a buyer/seller relationship. As I’ve said, it’s a substantial book. I’m actually in the middle of it right now. For me, most of the content in the book is a refresher. Some of it is slightly different takes on various concepts. The idea is to upsell you on different products he offers, such as ClickFunnels or a coaching program. He even has a million-dollar client coaching system. The million dollars comes from revenue your company would drive. This eBook is a great front-end offer. It’s a solid starting point for a very well-developed value that Brunson has in place. Need more advice on how to increase sales? Sign up for daily #MattHacks, a free video series on how to systematically double your business month after month. Because DigitalMarketer splintered off its product with this offer, it’s a tripwire. 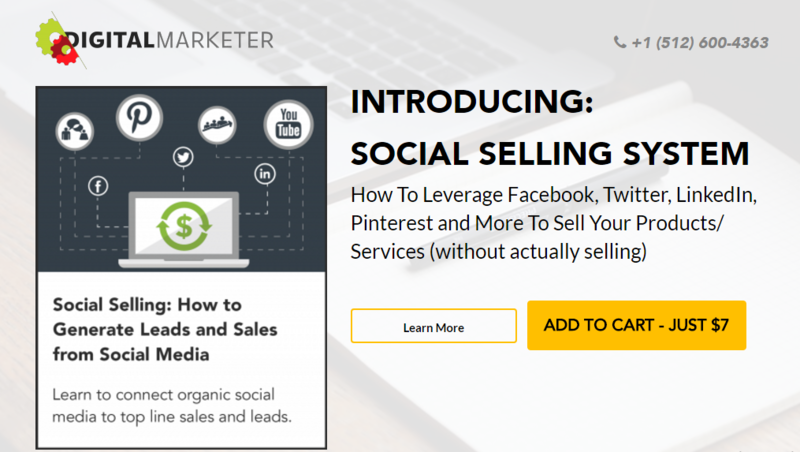 This is a nice segue into what could be a bigger course about selling on social media. The offer is simple. The value offered is specific. It’s clear that when you download this system, you can stop hard-selling people on social media. You’ll get a complete system with step-by-step directions. DigitalMarketer even gives a clear preview of their product through a few screenshots. This is more than just a simple five-page PDF. There’s a lot of substance here, and DigitalMarketer also addresses common questions. It’s packaged very nicely, which makes it an effective tripwire offer. It’s a complete, detailed and in-depth solution for people who want to learn how to sell using social media. The easiest way to make your own tripwire is to look at your current core offer. Think of how you can splinter off a piece of that. This can be in the form of an eBook, for example, just like Russell Brunson did. If you’re selling a service, what we used to do was to sell a “Project Roadmap.” We called this a “service slice” (same idea as a product splinter). This would cost $300 and helped us get paid for the time we put into planning the proposal. It also created an association between us delivering our expertise and our time. It made it easier for us to make our core sale. So look at what you’re doing now. See if you can splinter it, package it and sell it off to new email subscribers. If you are selling services, you’d want to sell the roadmap after the customer opts in and makes a consultation. Place the tripwire right after someone opts in to your email list. Make sure to include a risk reversal, like a 30-day money-back guarantee. 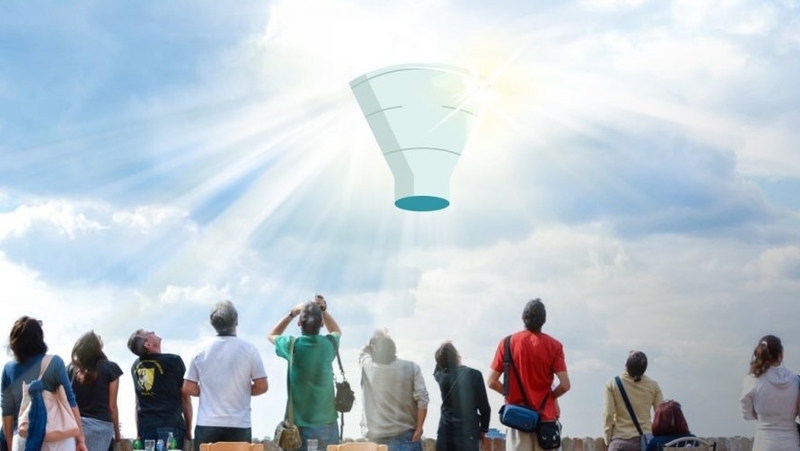 Not sure if your sales funnel is up to snuff? Compare it against my 11-Point Perfect Sales Funnel Checklist. Tripwire is an invitation to the customer to make a small purchase from you. It is offered immediately or shortly after opting in. A tripwire “ignites” the buyer/seller relationship, and increases core offer purchases. In other words, invest a little money, get some value. That builds trust and makes them more open to a future purchase, assuming it delivers value. The value of a tripwire is typically between $5 and $50. Keeping the value low entices customers to make bigger purchases once they gain trust in you. A tripwire is a useful way to get shy or reluctant customers to finally buy your core offer. Even if they would have refused before. An eBook is a good starting point if you want to make your own tripwire. Don’t forget to offer a risk reversal after opt-in. This further builds the trust between the customer and your brand. Have you ever used a tripwire before? What were the results? Are you thinking of ways to create tripwires for your own business? Let me know in the comments below. Thanks for the article Matt. You often hear different ideas as to how to build that customer relationship online – I’ve also heard that the first offer you make should be your core offer as sometimes selling 1 x product for $1,000 is easier than 10 x products @ $100. What are your thoughts? Selling one core product is good from a maintenance perspective — less work right? 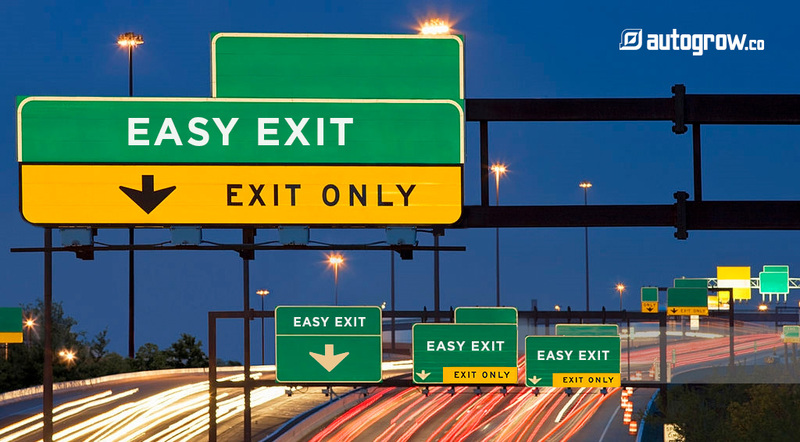 However, having an “on ramp” (tripwire) will grow your conversion rate. You don’t have to have it in place day 1, but you should add it into your marketing funnel nonetheless because it will help you grow. One easy way to do this (without growing the amount of maintenance you’ll have to do long term) is simply to “break off” a “piece” of the core product and make it a stand-alone tripwire. Great question, hope to hear more from you. Good question and great answer. I had the same question some time ago, and then after asking opinions, reading more articles and studying other cases I have figured the best answer for me. Check to see if it makes sense to you. sometimes, you need to analyze how fast your target is set to exhaust: If you convert too fast (let’s say 100 x $50) and you do it again and again, there will be a time in which you have already exposed your offer to (almost) all best possible buyers, and then you need to create a new offer. This isn’t bad, at all, since you get the benefit of acquiring hundreds of customers. But at a different point of view, with a mindset of max optimization, to generate more revenue with the lesser effort, you should try to raise the price of this offer (maybe to $200 if pertinent), so that you can make the same amount of money, while exhausting your market at a very slower level, so that at the end of the cycle this product can generate 4x more revenue! Fascinating way of looking it Bruno! Thank you for that. Hope to hear more from you.